Las ruinas del pueblo Tres Puntas están a punto de desaparecer, algunos pocos restos visibles se quedan en pleno desierto. . . There were only a few vestiges of the mining district, some walls, shafts, pits and stairs lost in the desert. List of all the mines and owners..
A listing of all historic mines with historical production information and owners . .
Tres Puntas is probably the second best-known historical mining district after Chañarcillo (in this case). Located about 80 kilometers away from Copiapó, actually in the desert. A large number of abandoned mines can still be seen with remains of plants and buildings. Some walls and foundations remained of the mythical village. Between 1848 and 1922, the production reached between 20 and 70 tons of fine silver annually. 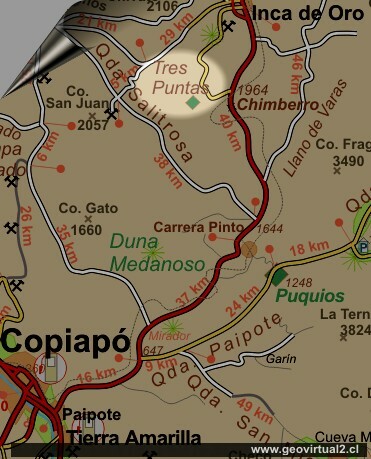 According to historical descriptions, Tres Puntas could be a model city of a western film (see: life in Tres Puntas). But on the other side of the coin there was a highly technical mining operation in this era. In particular, the mines of English printing companies achieved impressive production quantities (see: Good Hope). Unfortunately, the vetiform deposits did not continue into very high depths, the grades were lowered and the mineralization changed. But the boom period in this district was not as short as has generally been thought: almost 30 years after the discovery, fine silver production reached almost 27 tonnes. It should be noted that in those days (between 1895 and 1910) silver as a metal entered a global crisis. Silver metal prices fell to a historic low, and should not recover in the next few years either. Many mines lost their profitability forever. Location: 14 km to SW (straight line) of Inca de Oro.